The winter ice pack in the Arctic was once dominated by old, thick ice. Today, very little old ice remains. This animation shows maps of sea ice age from 1987 through the end of October 2013. Age class 1 means "first-year ice," which is ice that formed in the most recent winter. The oldest ice (9+) is ice that is more than 9 years old. 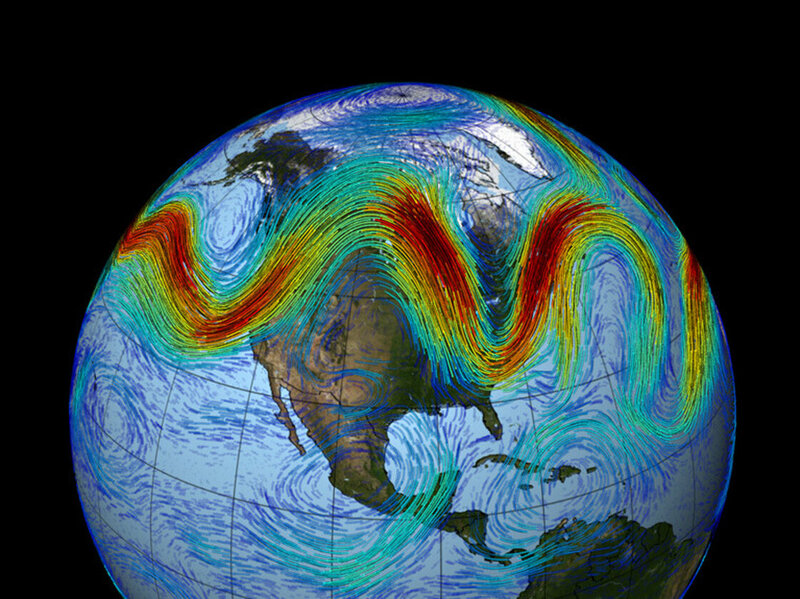 Animation by NOAA climate.gov, based on research data provided by Mark Tschudi, CCAR, University of Colorado. Take a second and watch older Arctic sea ice -- represented by white and lighter colors -- expand and retreat in this animation. By the end of the time-lapse, it's strikingly clear that older sea ice has declined dramatically since 1987. Scientists refer to older ice as "multi-year" ice, meaning that it has survived at least one summer melting season and is thicker than younger ice. In this video, the older sea ice is represented by the lighter colors, with the color white signaling ice that is more than nine years old. "Wind and ocean circulation patterns are conspiring with a warmer climate to reduce the amount of year-round (multi-year) ice, transforming the remaining ice into a younger, thinner version of its old self," explains NOAA. A new study published this month found that the summer melting season has increased by about a month since 1979. Additionally, the maximum extent of Arctic sea ice at its annual low-point in September has decreased by 40 percent since the 1970s, report researchers at the Scripps Institution of Oceanography at the University of California, San Diego. Looking at small scale and industrial fishing as well as fishing at sea, continental fishing and aquaculture, the video highlights FAO's Code of Conduct for Responsible Fisheries by exploring challenges facing the fishing sector and the sector's relevance for the world economy and people's diet. IN 1968 an American ecologist, Garrett Hardin, published an article entitled “The Tragedy of the Commons”. He argued that when a resource is held jointly, it is in individuals’ self-interest to deplete it, so people will tend to undermine their collective long-term interest by over-exploiting rather than protecting that asset. Such a tragedy is now unfolding, causing serious damage to a resource that covers almost half the surface of the Earth. The high seas—the bit of the oceans that lies beyond coastal states’ 200-mile exclusive economic zones—are a commons. Fishing there is open to all. Countries have declared minerals on the seabed “the common heritage of mankind”. The high seas are of great economic importance to everyone—fish is a more important source of protein than beef—and getting more so. The number of patents using DNA from sea-creatures is rocketing, and one study suggests that marine life is a hundred times more likely to contain material useful for anti-cancer drugs than is terrestrial life. Yet the state of the high seas is deteriorating (see article). Arctic ice now melts away in summer. Two-thirds of the fish stocks in the high seas are over-exploited, even more than in the parts of the oceans under national control. And strange things are happening at a microbiological level. The oceans produce half the planet’s supply of oxygen, mostly thanks to chlorophyll in aquatic algae. Concentrations of that chlorophyll are falling. That does not mean life will suffocate. But it could further damage the climate, since less oxygen means more carbon dioxide. For tragedies of the commons to be averted, rules and institutions are needed to balance the short-term interests of individuals against the long-term interests of all users. That is why the dysfunctional policies and institutions governing the high seas need radical reform. The first target should be fishing subsidies. Fishermen, who often occupy an important place in a country’s self-image, have succeeded in persuading governments to spend other people’s money subsidising an industry that loses billions and does huge environmental damage. Rich nations hand the people who are depleting the high seas $35 billion a year in cheap fuel, insurance and so on. The sum is over a third of the value of the catch. Second, there should be a global register of fishing vessels. These have long been exempt from an international scheme that requires passenger and cargo ships to carry a unique ID number. Last December maritime nations lifted the exemption—a good first step. But it is still up to individual countries to require fishing boats flying their flag to sign up to the ID scheme. Governments should make it mandatory, creating a global record of vessels to help crack down on illegal high-seas fishing. Somalis are not the only pirates out there. Icelandic fishing in the north Atlantic. Catching a big catch of fish,on a freezing trawler. Documentary of fishing in the valuable water around Iceland. Third, there should be more marine reserves. An eighth of the Earth’s land mass enjoys a measure of legal protection (such as national-park status). Less than 1% of the high seas does. Over the past few years countries have started to set up protected marine areas in their own economic zones. Bodies that regulate fishing in the high seas should copy the idea, giving some space for fish stocks and the environment to recover. But reforming specific policies will not be enough. Countries also need to improve the system of governance. There is a basic law of the sea signed by most nations (though not America, to its discredit). But it contains no mechanisms to enforce its provisions. Instead, dozens of bodies have sprung up to regulate particular activities, such as shipping, fishing and mining, or specific parts of the oceans. The mandates overlap and conflict. Non-members break the rules with impunity. And no one looks after the oceans as a whole. A World Oceans Organisation should be set up within the UN. After all, if the UN cannot promote collective self-interest over the individual interests of its members, what is it good for? Such an organisation would have the job of streamlining the impenetrable institutional tangle. But it took 30 years to negotiate the law of the sea. A global oceans body would probably take longer—and the oceans need help now. An introduction to the International Law of the Sea course at UCL. So in the meantime the law of the sea should be beefed up. It is a fine achievement, without which the oceans would be in an even worse state. But it was negotiated in the 1970s before the rise of environmental concerns, so contains little on biodiversity. And the regional fishing bodies, currently dominated by fishing interests, should be opened up to scientists and charities. As it is, the sharks are in charge of the fish farm. This would not solve all the problems of the oceans. Two of the biggest—acidification and pollution—emanate from the land. Much of the damage is done within the 200-mile limit. But institutional reform for the high seas could cut overfishing and, crucially, change attitudes. The high seas are so vast and distant that people behave as though they cannot be protected or do not need protection. Humanity has harmed the high seas, but it can reverse that damage. Unless it does so, there will be trouble brewing beneath the waves. China s most advanced research vessel Kexue was commissioned in east China s Shandong Province last October 2013 indicating that China s oceanic research capability has reached the world advance level. The research vessel Kexue will map the sea floor in the western Pacific. Six centuries ago, Chinese explorer Zheng He set sail into the Pacific Ocean with hundreds of vessels, starting a series of seven expeditions that extended China’s maritime influence from Indonesia to the Red Sea. China’s latest foray into the Pacific will be smaller but much more advanced. It will plumb a part of the ocean that could hold important secrets about east Asia’s summer monsoon and the periodic changes in ocean temperature known as El Niño and La Niña. Set to begin in April, the five-year research project will deploy five ships, a remotely operated submersible and an array of sub-surface moorings off the eastern coasts of the Philippines and Indonesia. The region is home to the western Pacific warm pool, a patch of surface water that is formed by trade winds that influence the formation of El Niño and La Niña in the eastern Pacific. The oscillation between these periods of warming and cooling affects global climate, and the pool itself might influence regional climate events such as the Asian monsoon. The Western Pacific Ocean System (WPOS) project is the largest single investment yet in China’s growing ocean-sciences programme, says Song Sun, a marine ecologist at the Chinese Academy of Science’s Institute of Oceanology in Qingdao. Over the past three years, the country has invested roughly 1.2 billion yuan (US$200 million) into Pacific Ocean science. Another $165 million will be spent on equipment and basic research costs for the WPOS project, and around 1,000 people are expected to participate. “It is a dream for Chinese marine scientists to go to the deep blue,” Sun says. Six arrays, comprising 29 moorings, form the core of the effort (see ‘Deep dive’). The arrays will monitor ocean currents at depths of between 400 and 6,000 metres, including the start of the powerful Kuroshio current, which runs northeastwards through the East China Sea. “We have had sporadic observations in different seasons, but we’ve never been able to get a comprehensive view of the oceanic currents in this region,” says Wenju Cai, a climate modeller at the Commonwealth Scientific and Industrial Research Organisation in Aspendale, Australia. Dunxin Hu, a colleague of Sun’s and a leader of the WPOS programme, says that the data should help oceanographers to understand the movement, temperature and nutrient load of various currents that circulate through the warm pool. 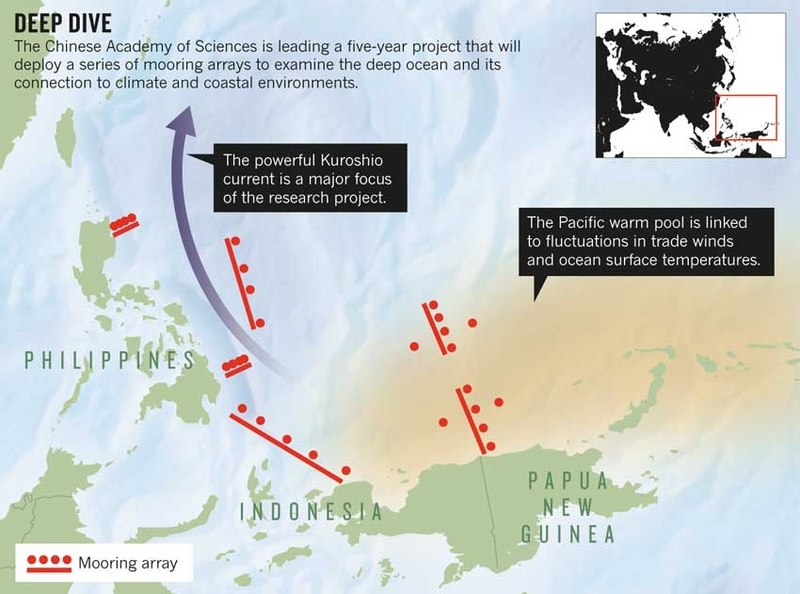 Scientists are particularly interested in the Kuroshio current because it plays an important part in global ocean circulation and helps to shape coastal ecology. A key part of the ecosystem research will track the flow of nutrients into China’s coastal waters and assess their influence on plankton blooms and fisheries. The data could also prove valuable for climate modellers. Trade winds from the east have been unusually strong over the past two decades (M. H. England et al. Nature Clim. Change http://doi.org/rdt; 2014), which has pushed greater volumes of warm water into the region and, ultimately, into the deeper ocean. The process has helped to stall the rise in global temperatures, which have remained relatively constant since 1998, but exactly what is happening in the deep ocean remains unclear. Hu says that data from the moorings could be used to trace the heat’s journey through the deep ocean. They could also reveal how the warm pool influences atmospheric convection and therefore regional climate, such as the monsoon in China. One of the biggest challenges will be linking the deep-sea data to conditions at the ocean surface and in the atmosphere. Many of the moorings will be in fishing areas, and worries about theft and vandalism mean that they will not include surface buoys. To get the surface data, scientists will need to incorporate observations from satellites and from the global Argo network of floats that provide periodic data about temperature and salinity to a depth of 2,000 metres. 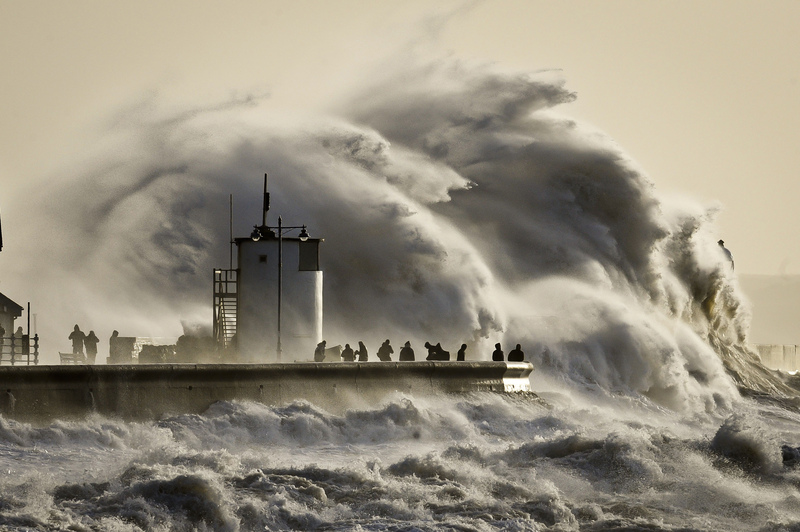 “That, I think, is the missing piece,” says Shang-Ping Xie, a climate modeller at the Scripps Institution of Oceanography in La Jolla, California. Researchers also plan to investigate the deep-sea geology and ecology. They will deploy sonar-imaging equipment from a ship dubbed Kexue (which means ‘science’) to map the ocean floor. After identifying seamounts and hydrothermal vents, the team will send down the remotely operated submersible Faxian, which is capable of diving to roughly 4,500 metres, to study the creatures that inhabit these areas, such as sponges and exotic fish. Peter Brewer, an ocean chemist at the Monterey Bay Aquarium Research Institute in California, helped to develop the submersible. He admires the Chinese scientists’ dive into ocean science. “They are at the stage where they have all of the hardware,” he says. Scientists have found a new way of keeping track of whale populations. Using high-resolution images taken by satellites high up in orbit, scientists are now able to count individual whales in the world's oceans. Before this new technique was conceived, scientists had to count whales using a more primitive and painstaking method. Researchers and volunteers had to board ships and count whales by looking for distinctive blowholes sprays and the occasional jumping whale. Aside from being inefficient and time consuming, this method is also not very accurate. Moreover, scientists are limited to counting whales one small area at a time. With the new method, however, scientists have something even better than a bird's eye view of the oceans. A team of scientists has used high-resolution satellite imagery to count whales. The images taken from orbit give scientists useful data for the the conservation and documentation of whale populations. 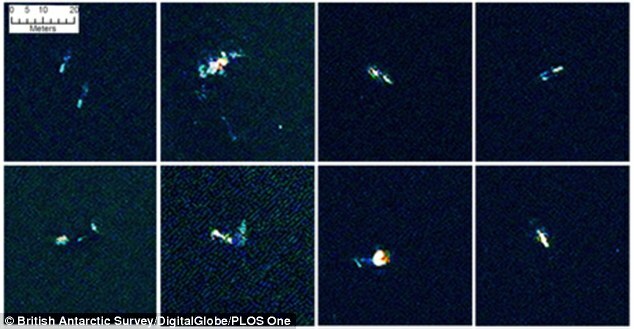 Pictured here are composite images of southern right whales seen from orbit. "This is a proof of concept study that proves whales can be identified and counted by satellite," says lead author Peter Fretwell of the British Antarctic Survey (BAS). "Whale populations have always been difficult to assess; traditional means of counting them are localized, expensive and lack accuracy." "The ability to count whales automatically, over large areas in a cost effective way will be of great benefit to conservation efforts for this and potentially other whale species," Fretwell adds. Aside from reducing the time it takes to count whale populations, using images taken by satellites also significantly reduces the cost of these surveys. Fretwell and his colleagues published their findings in the online journal PLOS ONE. While using satellites to count whales isn't exactly a new idea, previous attempts proved to be inaccurate due to limitations in technology. With today's crop of next generation satellites, however, counting whales from space is now both practical and accurate. 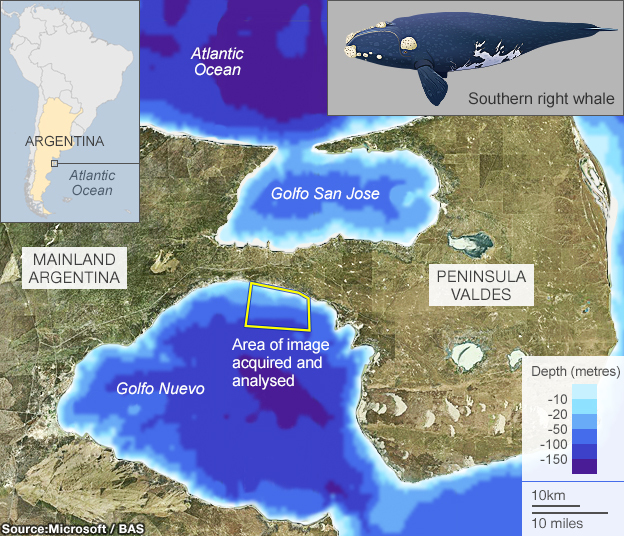 The team of researchers used a satellite image taken by the WorldView 2 satellite to count southern right whales that have gathered in a bay to mate and to give birth to young whales. The location was chosen due to the fact that the bay had shallow waters, which made it easier for the scientists to count the individual whales in the area. New high resolution satellite image processing technology allows researchers to identify and count right whales at the ocean surface or to depths of up to 15 metres — described as a boon to tracking the health of whale populations. The southern right whale is an endangered species that was almost driven to extinction due to excessive whaling. Scientists have been looking for an accurate method of gauging their current numbers to see how well the populations were growing. "Visual inspection of the image showed that a number of offshore objects, that were both the right shape and size (5 - 15 m) to be whales, could be identified in both the colour and the panchromatic bands," says Fretwell and his colleagues. "Most of these objects were visible across all bands although in most cases the high resolution of the panchromatic band rendered the objects in greater detail." Flip Tayamen has seen the wetlands of his childhood disintegrate and vanish. 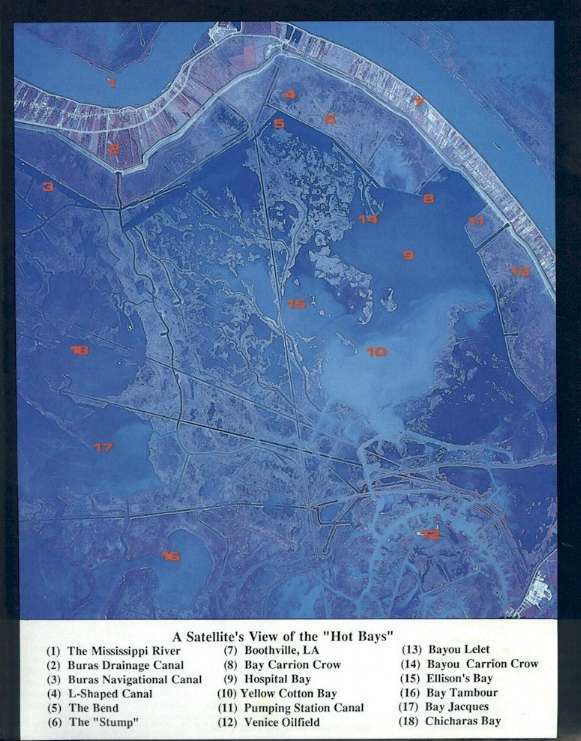 Still, he was stunned to hear that those bays and bayous, with names like Yellow Cotton Bay and Dry Cypress Bayou that offered him nets full of shrimp and shelter from storms, would no longer appear on maps. "It's really painful," Tayamen, 60, a shrimper in lower Plaquemines Parish, 40 miles south of New Orleans. "You don't know where you're going anymore. You don't know which way to point." Locals like Tayamen have seen the slow death of Plaquemines' wetlands for years. Over the past several months, cartographers at the National Oceanic and Atmospheric Administration have made it official, removing 40 place names from official nautical maps. 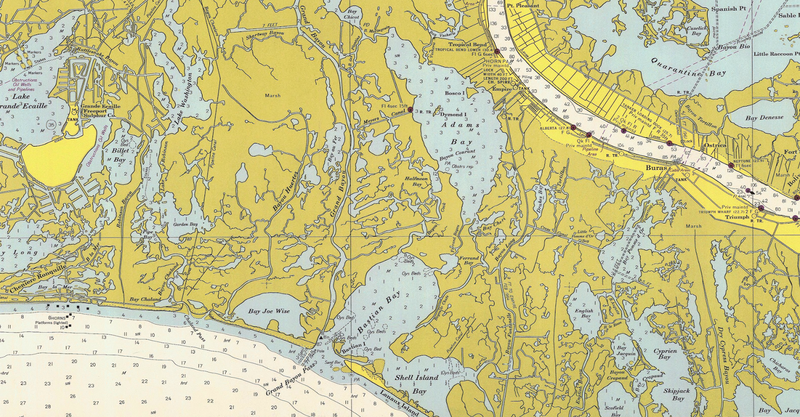 Bays, bayous, rivulets and islands like Fleur Pond, Tom Loor Pass and Skipjack Bay have been erased from federal maps. The reason: They're no longer there. 1891 USGS map of section of Plaquemines Parish, Louisiana including Pointe à la Hache. New maps are redrawn all the time with new features, said Meredith Westington, chief geographer at NOAA's Office of Coast Survey, which updates maps. But having such a high number of removals in one place – all along Plaquemines Parish – is unprecedented, she said. "This is the first I've seen it," Westington said. "I don't know that anyone has seen these kinds of mass changes before." The "Wagonwheel", an unusual circular pattern of canals just south of Yellow Cotton Bay, also owes its pattern to the combination of geology and extractive logistics. Here, the oil companies' canals depart from their typically linear vocabulary to follow the roughly circular limit of a raised salt dome. The names – 40 and counting – will be stored in the historical record at the agency, she said. But new maps will no longer show them. The list got so high that Westington began keeping a running tab on her desk – the only place in the USA that she's needed to do that, she said. A team of surveyors are still mapping the Gulf Coast and should be done later this year. "It's a little disturbing," Westington said. "It's sad to see so many names go." The new maps document a disturbing trend Louisianans have witnessed for years. The state has lost more than 1,800 square miles of its coastal marshes – an area larger than the size of Rhode Island – since the 1930s, due to sealing off the Mississippi River with levees to protect towns, natural subsidence and thousands of miles of transport canals carved out by oil and gas companies. In another rare move, a New Orleans area flood control board filed a lawsuit last year against 97 oil and gas companies, claiming they should fund billions of dollars in coastal restoration projects for their role in wetlands loss. Similar lawsuits by Plaquemines and Jefferson parishes followed. Only a fraction of a $50 billion, 50-year state plan to restore the coast has been funded. The move to make oil and gas companies liable has been fought by Louisiana Gov. Bobby Jindal, a Republican, who refused to re-appoint members of the flood control board involved in the suit. Garret Graves, Jindal's coastal chief, didn't return several requests for comment. Besides the transport canals – which allow saltwater to enter and erode marshes – Plaquemines has been battered by four recent hurricanes starting with Hurricane Katrina in 2005 and the BP oil spill, which infiltrated the parish's marshes, Plaquemines president Billy Nungesser said. His parish alone will need about $1 billion to save it from vanishing into the sea. NOAA removing names from maps was a wake-up call to how fast the crisis is mounting, he said. "It makes it hit home how quickly we're losing the coast of Louisiana," Nungesser said. "With a snap of the fingers, they're gone." The disappearance of those places was less of a surprise to Bradley Nezat, 49, a former fishing guide and current restaurant owner in Venice, La., at the southern tip of Plaquemines. Years ago, taking a boat out to the gulf required motoring through stands of Cypress trees. Today, all those trees are gone and each year the open water pushes closer to shore, he said. "It took thousands of years to make this peninsula," Nezat said. "It'll disappear much faster than that."